A friend of mine asked me a old question (I am really interested in) on FaceBook, which sparks me to dig the web again. These are some of mine findings. "Mongolian spots are most prevalent among Mongols, Turks, and other Asian groups, such as the Chinese, Japanese, and Koreans. 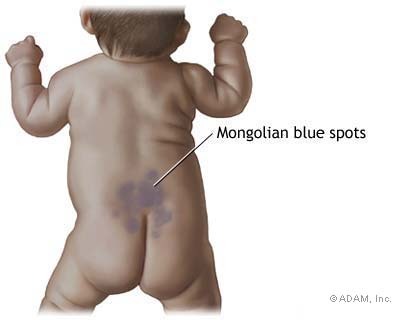 Nearly all East Asian infants are born with one or more Mongolian spots. It is also common if only one of the parents is East Asian. Among East African infants it is found at rates between 90-95% and 85-90% of Native American infants." "Mongolian spots are nothing more than dense collections of melanocytes, the skin cells which contain melanin, the normal pigment of the skin. When the melanocytes are close to the surface, they look deep brown." If your family carries at least one Asian Heritage, most likely you have it, or seen it. If this means you carry the blood of Mongolian, I think 85% of the world came from a same blood. "The Mongols say they are the mark left by the spirit who slaps the baby to life. Chinese believe that if you are reluctant to be reincarnated, the King of Hell prods and kicks you until you agree to go. The more spots, the more reluctant you were to be reborn." "Does anyone know if there is biblical side to the mongolian spot?" Tell me here if you find out more.. Here is a link to a Flickr set of Lego picture about organ harvesting of Falun Gong member in China, which purported by The Epoch Times. You can use them to educate you children in a.. hrmm refined way. Please tell them that it is rumored.